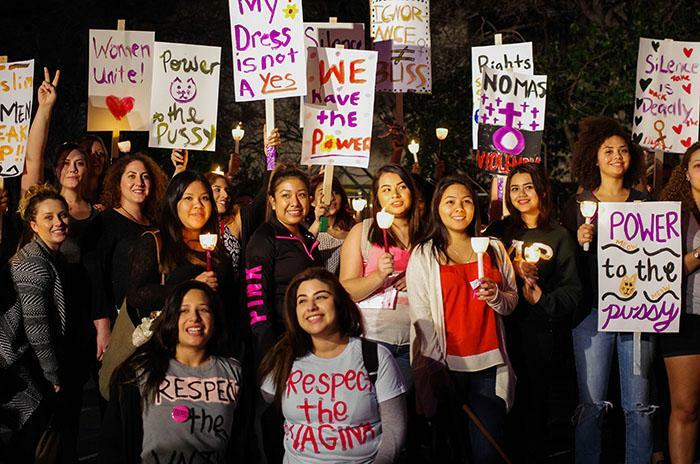 Strength, survival and inspiration were among a few of the words used by speakers at CSUN’s 12th annual “Take Back the Night” event to describe the evening’s message. Students, faculty and activists gathered at the University Student Union’s Plaza del Sol on Thursday night to rally against and promote awareness of sexual violence. 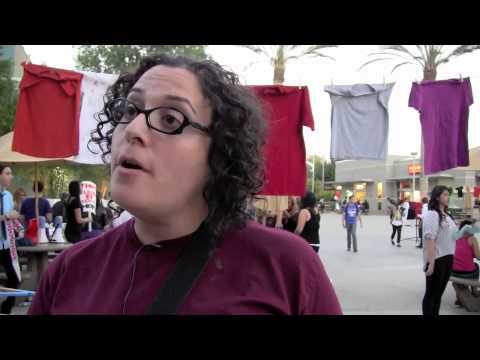 The event, hosted by CSUN’s Women’s Research and Resource Center, saw a crowd of around 50 men and women sporting handmade T-shirts and signs provided by The Clothesline Project emblazoned in paint with empowering messages. 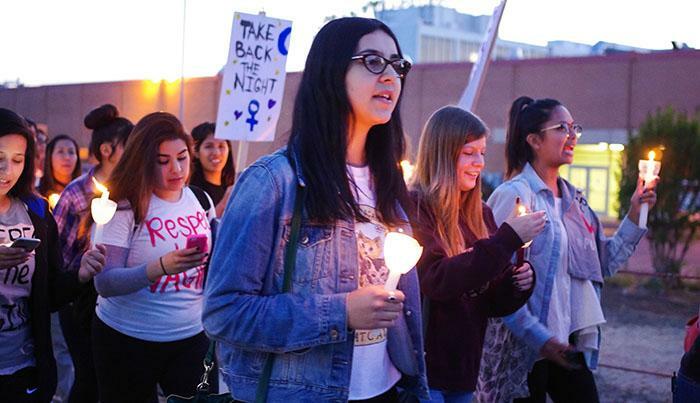 “At this ‘Take Back the Night’ rally, our goal should be eliminating all gender and sexual violence and all the dimensions violence takes,” said Dr. Dianne Bartlow, department chair of CSUN’s Women and Gender Studies program. The USU was filled with the voices of various speakers as well as a live performance by the female-fronted band TÜLIPS. Among the event’s speakers was Special Services Capt. Scott VanScoy of CSUN’s Department of Police Services, who detailed the various facilities provided by CSUN police for victims of sexual assault. Further into the evening, survivors shared their stories of overcoming sexual assault. Shelby Stephan and Alexis Lawrence, alumni of the Women’s Studies program, returned to CSUN to share their stories. Stephan and Lawrence are the women responsible for initially bringing the Take Back the Night event to campus. “’Speak even if your voice quakes’ became a mantra,” said Lawrence as she described the first Take Back the Night event at CSUN. 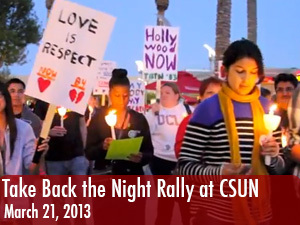 Lawrence had attended her first Take Back the Night at California State University, Fresno in 2004. Afterward, she and Stephan made it a mission to bring the yearly event to CSUN. “It was really incredible to see the light turn back on in people’s eyes just by being there,” said Lawrence. “Take Back the Night” events are held across the globe annually with the aim of putting an end to all forms of sexual abuse.